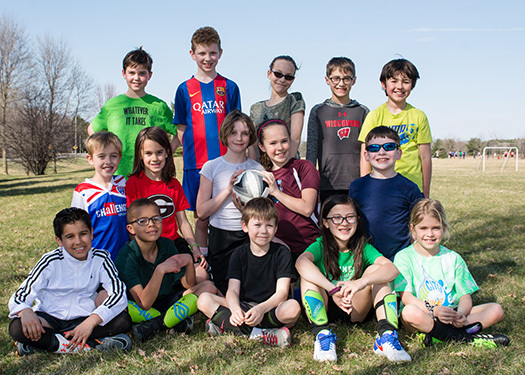 MCDS offers co-ed recreational soccer teams at each grade level from Kindergarten to grade four. We currently have U6 (Kindergarten), U7 (First Grade), U8 (Second Grade), two U9 (Third Grade) and U10 (Fourth Grade) teams that all participate within the Capital East Soccer Club in-house leagues. Practices are held at MCDS one day a week, and games are held on Saturdays on the East Side of Madison. The LS soccer teams are coached by a dedicated group of parent-volunteers. If you have any additional questions about LS Athletics, please contact MCDS Athletics Director Jeremy Clements at jclements@madisoncountryday.org. All of our Lower School soccer teams are coached by parent-volunteers to mirror the recreational model presented in the Capital East Soccer Club. Soccer experience is not necessary as training will be given to the volunteer coaches. An ability to be organized and a willingness to have fun are two qualities needed for a good coach. Practices will also be held on the day of the week that works best with the coach’s schedule. If you are interested in learning more about coaching opportunities, contact Jeremy Clements at jclements@madisoncountryday.org.